As the practice of doing work without a guarantee of payment, spec work is a highly debated topic in the design industry. While many people treat spec work as a part of everyday business that isn’t going anywhere, there are risks involved. Today, I’m giving you the inside scoop on 4 important reasons you should never do spec work. Does this sound any alarms? It should! As a designer, your work is valuable. There is nothing unfair about demanding payment for your excellent, well-thought-out work. As a designer my work takes on multiple stages, from research to strategizing concepts and iterating until I get it right. The entire design process is only successful through regular communication with the client. There is no such thing as guess work when it comes to design, which is what spec work is. A client asking a designer for spec work without providing guidelines to visual preferences and business goals is like walking into a restaurant, asking the waiter to choose a random dish for you, and then being unhappy with their selection. The best they can do is hope their guess aligns with your ultimate goal. AIGA, the association for design, put it best: “Little time, energy and thought can go into [spec] work, which precludes the most important element of most design projects,” which includes everything I mentioned above. Legally speaking, spec work can harm the client with plagiarized work. It can also harm the designer who delivers an original idea without being fairly compensated for it. Unfortunately, there aren’t many systems for claiming copyright ownership of spec design. This leads to misuse of work and even a trip to small claims court. Clients must consider the risks when cutting corners on a design’s cost. If a client ignores quality work through a partnership with a designer, the results will be unfavorable at best, and illegal at worst. For designers, spec work often involves spending hours toiling away to create a unique solution, sending it off, only to be rejected. Worse still, designers might get a rejection but see their designs implemented by the client anyway. Spare the trouble; avoid the situation entirely. 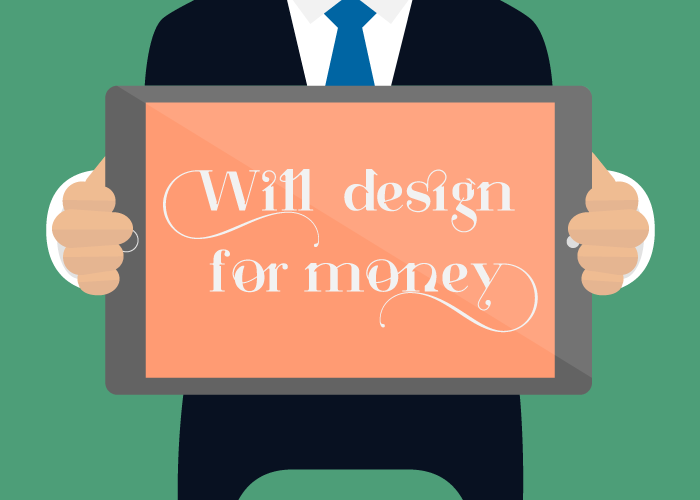 According to graphic designer, David Airey, “spec work can be frustrating for designers who feel the value of their profession is not understood.” The promise of getting free work is a powerful incentive. But it just tears apart the true value design can have towards achieving a client’s business goals. In other fields, it’s unthinkable to solicit businesses for free work. Design should be no exception. The effort that goes into design is misconstrued as effortless because of its creative nature. But the steps that actually go into the process of transforming an idea into a finished product are much less evident. If clients ignore the work that goes into a fleshed out design–conception, application, iterations before completion–they reduce design to nothing more than creative magic. Now sometimes, when clients ask for spec work it might be because they don’t understand what design actually entails. At this point, you do have an opportunity to educate the potential client on why particular processes are in place. If, despite your explanation, the client still requests free concepts, kindly thank them for the opportunity and tell them you’ll have to pass.